Quality is a passion within our organization, being second best is not acceptable to us. We are committed to and take pride in delivering superior quality in every order that we deliver to you each and every time. Our Quality Management System drives every facet of our business. Our documentation is exceptional, from our certificates of compliance to any other required documents. We understand any error in paperwork can cause a delay in your production so we make sure our paperwork is always thorough and complete right out of the box. 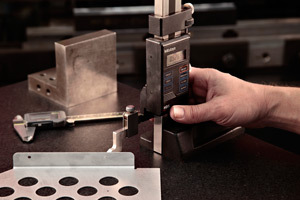 To provide you with the quality product expected we utilize state of the art measuring equipment. For the stringent quality requirements of many customers we use our Coordinate Measuring Machine (which is capable of importing solid models) and Optical Comparator to measure parts and verify to print specifications. We also use and routinely calibrate the standard quality measurement tools such as calipers, micrometers, Gages, and Rockwell Testers. As part of our dedicated quality efforts we will review your prints upon initial receipt to verify that all specifications are included and that it is feasible to produce in the manner requested. Many products have been re-designed to be more production friendly and cost efficient because of our upfront input.